The Bank of England today kept interest rates on hold and said weak growth during the snowy start to 2018 was likely to be only temporary. But the bank said it wanted to see a pick-up in the next few months before raising borrowing costs. In a sharp contrast to widespread expectations of a rate rise just a few weeks ago, the Bank of England said its nine rate-setters voted 7-2 to keep rates at 0.5%. That was in line with the latest forecasts in a Reuters poll of economists. The UK economy grew more slowly than most of its peers last year after a Brexit-driven jump in inflation hit consumer spending power and some businesses delayed long-term investment. Growth slowed even more sharply in the first quarter of 2018 due to a mix of unusually snowy weather and ongoing headwinds from Britain's impending exit from the European Union. Surveys have suggested little rebound last month. The Bank of England said today that underlying growth in early 2018 would probably prove stronger than initially thought, but most of its policymakers wanted to wait to be sure. "The recent weakness in data for the first quarter had been consistent with a temporary soft patch, with few implications for the outlook for the UK economy," the majority of the bank's Monetary Policy Committee members said. "There was value in seeing how the data unfolded over the coming months, to discern whether the softness in Q1 might persist," they said. This potentially leaves the door open for a rate rise in August, the next time the Bank of England updates its economic forecasts. Policymakers Ian McCafferty and Michael Saunders, who voted again for a rate rise, agreed the weak growth so far this year reflected "temporary or erratic factors", but warned that delaying a rate hike risked more abrupt tightening later on. Bank of England Governor Mark Carney suggested in April that the central bank might not raise rates in May because of the mixed economic data, causing a sharp reversal in bets on a May hike. The turnaround represented the latest time that Carney has been forced to rethink the bank's guidance about interest rates. 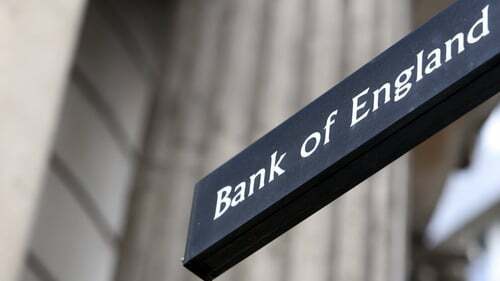 The Bank of England said today that inflation had fallen faster than it expected. But this was due to a faster fading of the impact of the plunge in sterling on the price of imports, and that domestic inflation pressures continued to rise. Inflation was seen dropping to 2.1% in a year's time, and returning to target a year later - sooner than previously thought - but only if interest rates rose by 25 basis points about three times over the next three years, as markets expect.